Mexico was full of surprises. In January 2015, Kristina and I travelled to the gorgeous Riviera Maya on the Mexican Yucatan peninsula. An hour or so south of Cancun, we spent most of our sun-soaked holiday in the resort near Tulum, indulging in total gluttony and relaxation. Each morning before breakfast, we would take the time to reconnect with ourselves by spending an hour meditating and practising yoga. Or attempting yoga in my case. Never ones to be sat somewhere too long, we often ventured out of the perfectly kept complex to explore. One day we happened upon this beautiful golden beach in Tulum. Clothes nor money appeared important here. It was free in every sense of the word. The sky was blue, the water was warm, the mosquitos were in check. It was paradise. By chance we stumbled across our yoga teacher, who had mentioned at the end of a class that she ran paddle board yoga retreats. I had my new camera and its underwater housing, and posed her a challenge. Could she perform her yoga on a paddle board in the Gulf of Mexico? 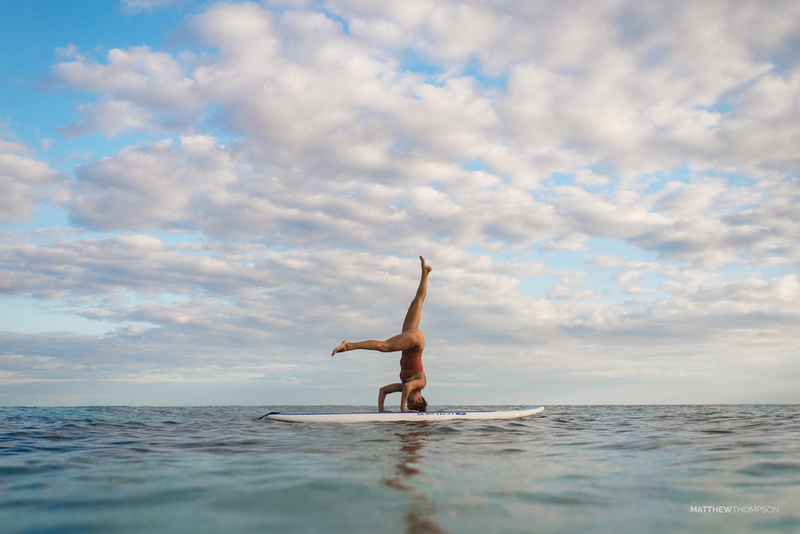 Eva Radwanli organises paddle board yoga retreats in cenotes and lakes around Central America, but had never practised her balance on the surf. The initial shock of such a random request quickly melted into determination. We approached the hut nestled 50 metres away and struck a deal with the awesome guys behind the counter. A board for some photos. After a few minutes of getting used to the board's swaying with the tide, Eva proved herself to be a master. Just look at what she is doing on that board and try to grasp the concentration and strength needed. She was pulling poses I didn't know the body could do. It was amazing to watch. I learnt a lot of lessons on this shoot, most notably being 'always be prepared'. After 10 minutes of trying to hold myself and my camera above the water (don't worry, it was in the housing), I was exhausted. I was only wearing my booties, and not the fins that fit around them. Thankfully Kristina grabbed them for me while I had the best cardio workout in a long while. And before you ask, shooting from another paddle board wasn't an option. I felt this would have been cheekier to ask for as the shop was loaning us one for free, and I knew I wanted a very low angle shot from the water's surface. And hey, who doesn't love a challenge? Have you been anywhere or done anything awesome lately? Let me know in the comments below.